Good to see you back Pam–cakes and all! 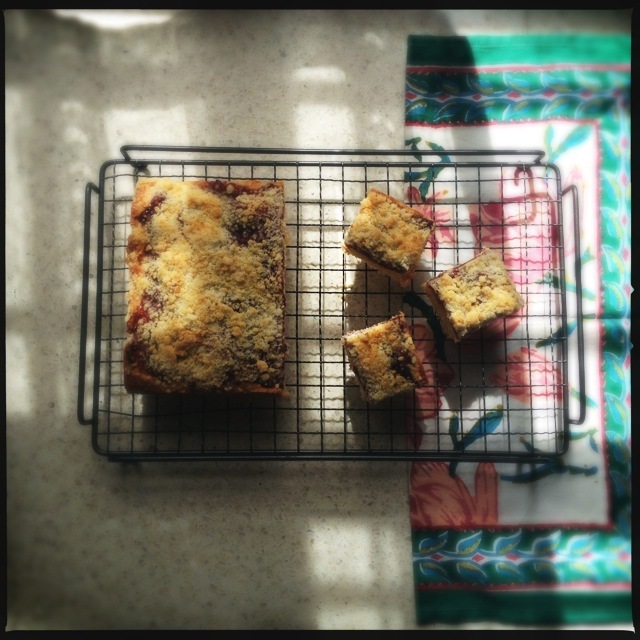 Loving this tray bake, I like a separate layer of fruit on cakes or cheesecakes and this one with a crumble layer is double fun..
how is caster sugar different from icing sugar? Can they be used interchangably? Oh, Pamela, you have no idea how much your wonderful cakes have been missed both by the family, and at Church! So good to have you back. Now does this mean that the book is now finished and on its way to the printers? When and where can we buy a copy? Sonali – caster sugar is a finer grade of granular sugar, whereas icing sugar is fine, like a dust and mixes to a paste. If I don’t have caster sugar when cooking fruit I use the finest ordinary granular sugar I can find. Icing doesn’t somehow seem quite right. I don’t know what Pamela thinks – and of course I don’t know exactly what is available in India. I stumbleupon this blog and enjoyed reading the post, Great, and thanks for posting such a nice one.